Summer festival season is underway, and you’ve dusted the cobwebs off your wellies and checked for spiders inside. No longer just for puddle jumping toddlers, wellies are now an essential item for any self-respecting music festival-goer. Super models made wellies chic… skimpy outfits for the sunshine, welly boots for the mud underfoot. That’s what the Great British festival season is all about. Rock music, sunshine, mud… and camping. So, I’ve teamed up with my favourite bespoke cookie baker, Alli at Custom Cookie Co, to bring you a summer festival special. 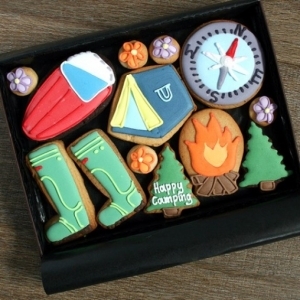 Enter our #SummerFestival #Wellies competition for your chance to win a personalised box of Custom Cookie happy camping hand-iced cookies, complete with wellies – and a This is Nessie bespoke welly print glass chopping board. With these prizes you can join in the festival spirit without even leaving your sofa! Alli’s talented team at Custom Cookie Co bake each gift fresh to order, and carefully hand-ice each unique gift – just choose 3 words to be iced on the cookies for your perfect personalisation. 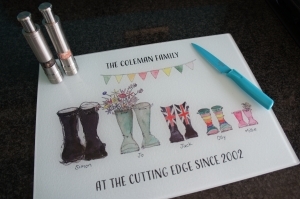 Through my affiliate marketing relationship with This is Nessie, the winner will also have the chance to personalise their bespoke welly print glass chopping board. Just choose a pair of wellies for each family member or friend, supplying their names and ages (just for sizing) – oh and we can add paw prints for your furry family members too! Choose a title for the top of your image, and there is also space at the bottom, so be as creative as you like – I’m seeing maybe a festival name or camping location at the top, and ‘muddy boots and puddle jumping’ at the bottom – a unique reminder of your summer adventure. ENTER NOW – competition ends midnight 26th June 2016. Facebook: Like @CustomCookieCo & AlysonatThisisNessieSurrey pages, as well as the competition post itself. Comment with #SummerFestival #Wellies. Sharing the post is not a condition of entry, but we’d be delighted if you did! Visit Custom Cookie Co website to find out more about their delightful bespoke personal gifts and corporate marketing and branded cookies. 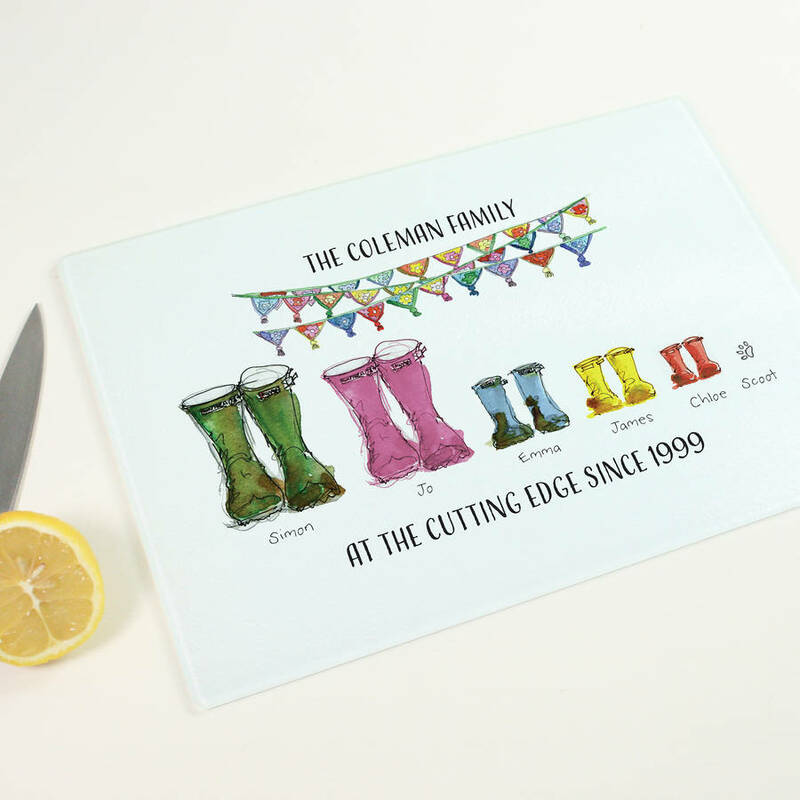 Visit This is Nessie website to find out more about their illustrated personalised stationery and prints. I offer all new customers 15% off their first order from the website with discount code TININDIGO16AR. For help with design and ordering, especially for all new gift items not yet on the website, please contact me and you will receive free P&P. No purchase is necessary. This competition is open to all UK residents except our employees, the companies or organisations with whom the competition or offer is being run, their agents, or anyone directly connected with the promotion. This competition is run with This is Nessie and Custom Cookie Co who are responsible for the provision of the prizes. There is no cash alternative for non-cash prizes, and prize winners must accept prizes in the form offered. Prizes are not refundable or transferable. The closing date for receipt of entries is as stated as midnight 26th June 2016. The winner will be drawn at random from all valid entries, and will be notified via mode of entry on the 27th June 2016 and must supply a UK address and personalisation details to AlysonR@thisisnessie.com on the 26th June 2016. All entrants to competition are deemed to have accepted these rules and agree to be bound by them, and agree to any publicity that may arise including their name being used on websites, or social media at any time as a result of the competition. Suppliers cannot be held responsible for the breakdown in communication systems that may result in a entry not being registered. The decision of the judges is final and no correspondence will be entered into. Winners will be selected at random from all entries. Prize may vary from images displayed.